SAVOR THE DAY: I'm all grown up! In the Jewish faith, a boy becomes a man at age 13 when he has his Bar Mitzvah. In the American car culture, adulthood comes when mom hands over the keys to the family car. Yet others mature at age 18 when casting that first vote on Election Day or when deciding to put their life on the line in the US Military. For many, that first legal drink at a bar at age 21 marks the transition from childhood to adulthood. For me, however, this moment came years later. By the time I actually grew up, my friends were driving station wagons and spending their evenings changing diapers. I just bought my first Christmas tree. I am now an adult. My mom likes to get the family Christmas tree the day after Thanksgiving. For years I’ve helped her choose the tree and decorate it. We listen to Christmas music and as we unwrap each ornament, we reminisce. As we carefully place the ornaments on the tree, we laugh about my former attempts to prove the existence of Santa Claus and about how one year I left him vitamin C and vegetables instead of cookies. The family tree has always felt like my tree, and so I never bothered to get one for my own home. I am extremely practical, but at the same time I’m a dreamer. Mix the two together and what do you get? No Christmas tree. The practical part of me believed a tree for myself wasn’t necessary since I’m never in my own home for Christmas and my apartments have always been so small. On the flipside, the dreamer part of me wanted to wait to share this with someone special. Years later when my children are grown, I wanted to be able to unwrap ornaments with them and say, “This is from the first tree that Dad and I ever had." But this year I said sayonara to the practical me and to the dreamer me and got myself a Christmas tree. It’s big enough to make a statement but small enough that it still fits in my tiny living room. I love everything about the holidays. Why deny myself the nighttime glow of a tree and the feeling of warmth and magic? My cats had a blast attacking the tree…and the lights…and the ornaments, and my dog wanted to drink the water and attack the cats attacking the tree. I’m starting to realize that this memory will not preclude me from making new memories and creating new traditions when I have a family of my own. Wanting the Christmas spirit to continue to fill me, I decided to decorate the outside of my house as well. When it glows in the evening, I feel this happy feeling flow through me. It’s beautiful, and I created this for myself! What experiences or items have you been saving either because they didn’t seem practical or because you were waiting for the right people or the right time? Sometimes saving things for special occasions makes them that much more special, but sometimes it just makes them dusty. My parents recently decided to drink some wine from their “reserve” collection, but when they opened the bottles, they realized that they’d waited too long and the wine had gone off. As a child I saved my Easter candy so long that it was stale by the time I decided to try it. What are you waiting to do? What if that time never comes? I’m trying to make this my new motto. What if I never have the family of my dreams? Getting a Christmas tree of my own doesn’t help me meet the right guy, but it does, in some small way, help me feel more grown up and more complete. I made a batch of this to drink while I was decorating my tree, even though it was 70 degrees outside. It’s not the holidays without a steaming mug of cocoa and Christmas carols playing in the background. Whisk the milk, cocoa powder, and sugar together in a small saucepan over low heat until steaming. Remove from heat and add the coffee liqueur and peppermint extract. Divide between two small mugs and enjoy. This cocoa is very thick and rich. A little bit goes a long way toward spreading holiday cheer. i love that you got a tree for yourself. it's so cozy. 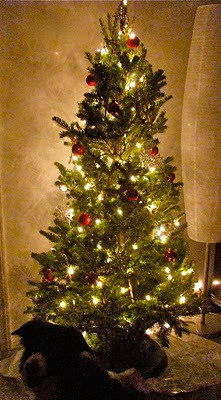 :) i love my tree...it's just little, but it does the trick. and this hot cocoa looks AWESOME cause it can be vegan. thank you so much. wooo!! Save something, but do not wait with enjoying the good stuff. When my dad died, and we worked our way through his house, I found the mackerel fillets I had brought him 6 months ealier, still in the freezer. He lived in the Canary Isles, and with me in Norway, I didn't see him as often as I'd like, and visiting always meant bringing treats he couldn't get there. Finding those mackerel fillets was the saddest thing ever. He hadn't enjoyed the treat, he had enjoyed saving it for a special occasion - which never happened. So I say enjoy your treats, like having your own Christmas tree, and if you need a special occasion, don't wait for one - make one! You definitely hsve an occasion, and are making the most of it. Go you! And next time I make cocoa, I'll add a few drops of peppermint and raise my cup to salut you. Ah, this is beautiful & so is your home. You are always such a joyful inspiration Meadow. You may not always feel it (who does) but that is what you send out into the world .. always. Was thinking this cocoa would be great for the next girls night but then I decided I'm going to make it for me .... alot. Meadow, you're such an inspiration! I just love you so!